Shocking! Unbeleivable! What is this gardening world coming to!? Some people do not like mums. How can that be? Is it the smell? They do have a funny mum smell, but it isn't that bad. Is it that they don't overwinter well? Well, they don't if you put them in a container now, let them bloom out, and then right before the ground freezes, try to plant them. That will never work! Instead you should plant them right away, before the buds open up, and let them get established well before the ground freezes. Then once they are done blooming, cover the base with mulch, but do not cut off the stems. Let them go until you see signs of new green growth coming up from the base in the spring, then cut them back. I've grown the same mums, pictured above, for over a dozen years, and even moved them this spring back to a holding bed in the vegetable garden, and they are still doing just fine. And a dozen years is hardly a record for mum longevity. Is it that mums are everywhere in the fall? Well sure they are! They provide good color now. Nothing wrong with that. I have no problems with my mum! Er mums! In fact I just bought three more to add to the fall colors. When I worked in a flower shop I did not like mums - they were just so common. I also didn't care for roses or carnations. Now that I am a gardener, I love mums and the wonderful fall color they provide! I'd not heard of them, but with the shape and colour in your picture, what's not to like? Hi Carol, we love mums! But not the butterballs you see for sale everywhere, although they have their place, as annuals. The Korean types, like the sheffies, are quite hardy and beautiful. I can't imagine the fall garden without them. 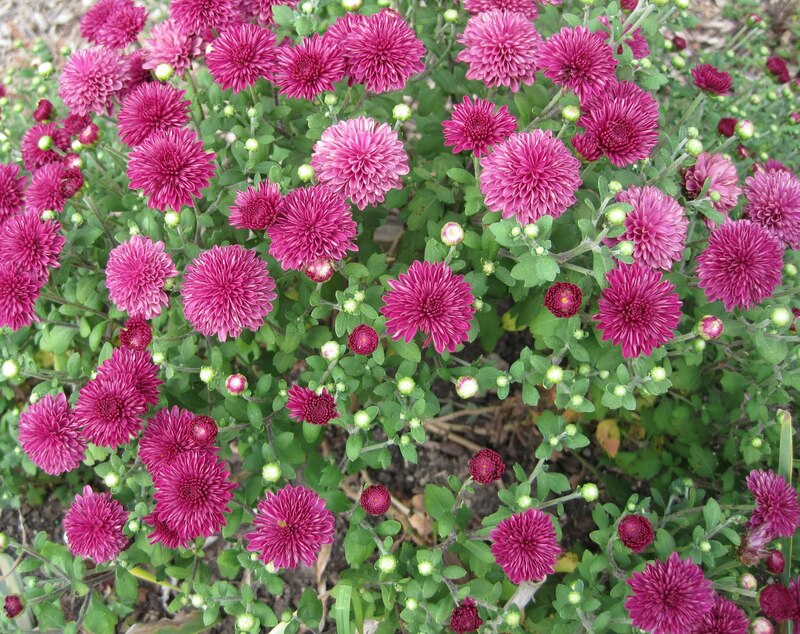 I like mums and again I have purchased several. However, I do not have the room in my small garden to winter them over and take the place of several perennials all summer. So, for me when I buy them I know I won't be saving more than a couple in the veggie garden. I have lots of mums with buds ready to pop. I've had them overwinter well in containers if the containers are somewhat protected. I then put them in the ground in the spring. I love mums - and I love the smell! I'm going to put some new ones in the ground this week. I just bought another one today, though this one is for the fire station. I bought one last year for the front, and they did a good job with it, it's blooming wonderfully. My son even remembered to cut it back in June. But now they need one on the opposite side. They've planted many flowers before but no one has time to properly care for an actual garden so the mums fill in very nicely! I have a few myself, my house rabbits love the flowers as treats! LOL My niece swears she hates them, yet every fall, her flower beds are bursting with blooming mums! Like them or not, you just can't beat that spectacular fall color! Hear Hear! (Or is it Here Here!) I'm about to get my Mum fix this week. Even though they give me a rash. With room in the raised bed, a few will be going right into the ground while others will be placed with pumpkins on the front porch. Thanks for this post. Sometimes garden people take themselves so seriously! If people like mums in the fall (and I do), whatever is wrong with that?!? OK, maybe they are worth a second look, I've certainly always claimed to hate them, they remind me of the sorry offerings on garage forecourts. Then again I used to think I hated Dahlias, and now can't get enough of them, and the photo you posted is beautiful... Thank you for challenging my prejudice!! I don't like the shape. Something about it irritates me. The daisy-shaped mums like 'Clara Curtis' and 'Sheffield Pink' are ok, but those goofy button ones and those overgrown "football mums" that look like a linebacker on steroids are just too much for me. I have to admit to being a mums snob. I use them a lot in client installs in Fall, but I guess I think the smell is what bothers me personally. And the fact that I have to hunt down particular colors for clients, then in Spring the lawn crew WEEDS them out. Rarely do any make it for a second year because they do kinda look like weeds in Spring. Clients and lawn crews give them the heave ho. Cute post though. Good Monday humor. I intend to try it myself, Carol.